But now GE faces a different kind of challenge — a nightmare cash crunch that could take years to recover from. GE(GE) has been left in turmoil by years of questionable deal-making, needless complexity and murky accounting. For GE’s 300,000 employees and millions of shareholders, the consequences have been painful. More than $ 100 billion in market value has vanished from GE since November 2016, more than the combined values of Ford(F), Delta(DAL) and UnitedContinental(UAL). GE, still a staple in investment portfolios, has plummeted 42% this year. The stock crashed to a six-year low last week after the company admitted it can no longer afford the dividend that once symbolized its stability. It’s only the second time since the Great Depression that GE has cut the dividend. Thismainstay of corporate America is experiencing a low point even as the rest of the economy surges. Welch, the CEO from 1981 to 2001, built GE into a super-conglomerate that owned a major bank and NBC. But that business model has since been cast aside as overly complex, and in retrospect, it’s clear that Welch’s shopping spree masked problems. “Immelt inherited a company from Jack Welch that had brushed a lot of issues under the rug,” Inch said. Not long ago, the criticism of Welch would have been unthinkable. He was a larger-than-life force whom Fortune named “manager of the century” in 1999. That aura has since been punctured. Consider GE’s $ 9.5 billion acquisition of Alstom’s power business, which makes coal-fueled turbines used by power plants. The 2015 transaction was GE’s biggest-ever industrial purchase. “If we could go back in the time machine today, we would pay a substantially lower price than we did,” Flannery said on CNBC. Elsewhere, he said GE overpaid for many of its oil-and-gas properties, forcing it to merge those businesses last year with Baker Hughes(BHGE), a major provider of services and equipment for oil drilling. GE said this week it’s already exploring ways to exit its majority stake in Baker Hughes. GE has had an “abysmal M&A history,” Scott Davis, CEO and lead analyst at Melius Research, wrote in a recent report. Much of it occurred under Immelt, who himselfonce had a reputation as a world-class CEO. He was named one of the “world’s best CEOs” by Barron’s three times and sat on CEO councils under both President Trump and former President Barack Obama. 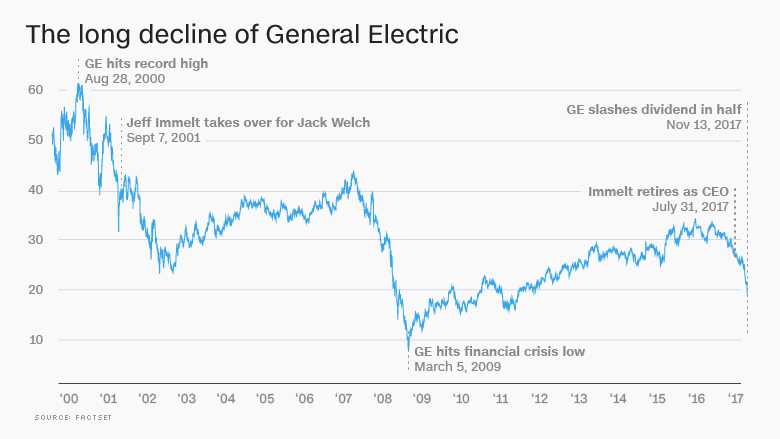 Yet GE was the worst-performing stock in the Dow during Immelt’s 16-year reign. It was an original member of the venerable stock average. Now there’s talk of kicking GE out of the Dow altogether. Immelt is gone now, and GE is shedding businesses — but at a time when many of those businesses are at a low point. For instance, the company has put its century-old railroad business up for sale. But Flannery has warned that rail faces a “protracted slowdown” in North America, suggesting that buyers will not exactly be lining up. 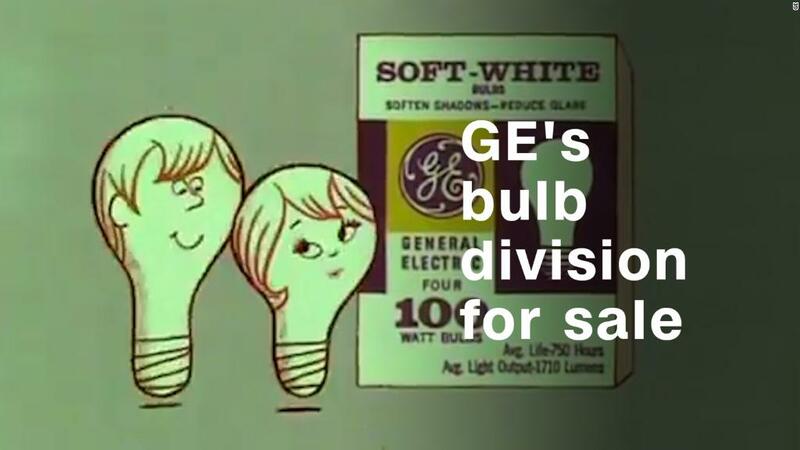 Likewise, GE is looking to unload its business that makes light bulbs — the product that, perhaps more than any other, symbolizes the company’s history of innovation. Light bulb sales soared between 2007 and 2014, thanks to the LED lighting that GE helped to invent. The problem is that LED bulbs last for decades, so sales have tumbled. GE Capital became a huge liability during the financial crisis. It got so bad that GE couldn’t borrow money when the overnight lending market vanished, forcing it to get an emergency investment from Warren Buffett and other investors. “They got caught in the middle of the financial crisis,” said Patel. “They were too proud. They couldn’t let it go. By the time they spun off GE Capital, it was already damaged and nobody would give them a fair price,” Damodaran said. GE has long been criticized for using cloudy accounting and confusing reporting metrics that made it difficult for investors to determine the company’s true health. The SEC charged GE with accounting fraud in 2009, alleging the company used “overly aggressive accounting” to make false and misleading statements to investors. GE agreed to pay $ 50 million to settle the charges, though the company neither admitted nor denied wrongdoing. GE’s accounting remains controversial. The Wall Street Journal published a recent series highlighting how the company’s “murky” accounting makes it hard to understand its cash flow. Take GE’s “industrial CFOA,” which is supposed to gauge free cash flow. But a footnote explains this measure excludes deal taxes as well as pension plan funding, a huge cost at GE. Accounting scrutiny is a headache GE does not need. Flannery already faces what he calls a “heavy lift” turning around this great company. He expressed optimism about that challenge, citing GE’s long history of remaking itself. The goal is to make the GE of the future more nimble, easier to operate and squarely focused on its core strengths: health care, power and aviation. Flannery has also vowed to improve GE’s culture by making it more open and transparent. And to do a better job of allocating GE’s limited resources. “This is the opportunity, really of a lifetime, to reinvent an iconic company,” Flannery said.